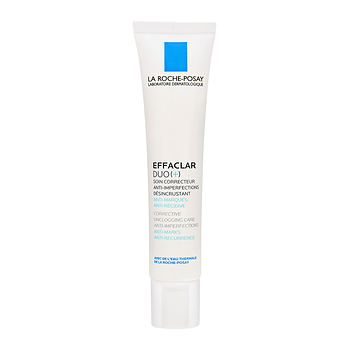 La Roche-Posay Effaclar Duo [+] has the following features : An exclusive ingredient - Procerad™ - complete care with reinforced anti-imperfection and anti-marks efficacy. Unclogs blocked pores and fights against marks. Fresh Gel-Cream texture, absorbs quickly for a non-oily and non-sticky finish. 24 hours Hydrataion. Non comedogenic, Hypoallergenic and Nickel-tested (developed for people who are sensitive to nickel). After 24 hours: imperfections look visibly less red*. After 8 days: localised imperfections appear significantly reduced*. After 4 weeks: pores look unclogged, skin texture looks refined. Controls the appearance of shine**. * Cosmetoclinical study - 38 subjects. ** Cosmetoclinical study - 51 subjects.